From the knightly arts of combat to the most necessary part of a gentleman's education, western swordsmanship has existed in many forms throughout the ages and all of Europe. 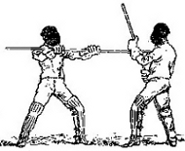 As an art and a science, both technical and esoteric in nature, the Noble Art of Defence has been studied, refined, and taught, from its most basic precepts to its deepest levels of understanding, for centuries by acknowledged historical fencing masters. Many of these masters wrote and published their systems and techniques in treatises which survive today and from which we can base our knowledge of the original principles and approach of true martial swordsmanship. European martial arts and historical fencing can be accurately interpreted from the earliest surviving texts of the late 13th century right through to 19th century treatises, all detailing martial principles and techniques for over forty different weapons forms, six centuries of development, characteristic national styles, and multitudinous accepted academic and social combative customs. The Macdonald Academy of Arms follows in the traditions of historical Edinburgh fencing academies, such as those of Sir William Hope, a Scots fencing master who taught in the city from the late 17th to the early 18th centuries, and the Royal Academy of Exercises, which flourished in Edinburgh under the famous fencing masters John Xavier Angelo and George Roland from c. 1763 to 1870. Today, instruction at the first professional European Academy of Arms to have been established in Edinburgh in 200 years is given by Maestro Paul Macdonald, a swordmaker, Master-at-Arms and a founder of the International Masters-at-Arms Federation. The impetus of the Macdonald Academy's approach is that of martial swordsmanship. It is not derived from, nor aspiring to, any sporting, theatrical, or re-enactment approach. Whilst maintaining respect towards other sword-related disciplines, the emphasis of the Academy's teachings is that of training individuals by the same methods and according to the true intent and approach as required of swordsmen from centuries past. That same approach bears great relevance in modern society, as it not only develops practical martial ability, but takes us on a path of understanding, essentially of ourselves but also of others, the benefits of which are as directly applicable today as they were in yesteryear.